Born Konon Trofimovich Molody in 1922 in Russia. Moved to California in 1929 and lived with an aunt, becoming fluent in English. Returned to Russia nine year later and became involved with Communist organizations. Joined the Soviet Red Navy and saw action during World War II. Was involved in intelligence activities during and after the war. Was accepted into the KGB and trained as a spy. Took the name Gordon Arnold Lonsdale from a Canadian who had moved to Finland and died. Journeyed to Canada and the United Stated and then moved to England in 1955, posing as a businessman (rented jukebox equipment), while actually uncovering information about British underwater capabilities. Developed a relationship with Harry Houghton, a former Naval petty chief, working in the Underwater Weapons Research Establishment in Portland, Dorset. Houghton’s girlfriend, Ethel Gee, worked in the records office of the same Underwater Weapons Research Establishment. Gee was introduced to Lonsdale who claimed to be a naval attaché for the United States interested in naval research information that Ireland was withholding in defiance of a NATO agreement. Gee agreed to provide secrets, bringing home top secret documents for Houghton to photograph and then returning the next Monday before thy could be discovered missing. Houghton and Gee met Lonsdale once a month. Polish Intelligence defector, Lt. 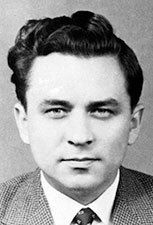 Colonel Michal Golienewski exposed Lonsdale, Houghton and Gee (as well as George Blake), which subsequently led to their arrests (as well as the arrest of Morris and Leona Cohen). The trio was caught with information about the nuclear submarine Dreadnaught, pamphlets and photographs and undeveloped film of classified British documents (January 7, 1961). Lonsdale was convicted of conspiring to pass classified information and was sentenced to 25 years in prison. In 1964, Lonsdale was exchanged by the British for British agent Greville Wynne and traveled back to the Soviet Union where he was hailed as a national hero, writing a KGB sponsored book (with the help of Kim Philby) entitled Spy in 1965. Suffered a heart attack outside of his apartment and died in 1970.